Who is facing this issue? It was brought to our attention, here in EVERWORKS, that there are people in Cambodia that are without toilets. We also found out that achieving universal access to safe water and sanitation would save 2.5 million live every year (WHO 2008). This to us is serious. Who brought this to our attention? The Cambodian Toilet Crisis was brought to our attention through a group of University students from the University of Wollongong in INTI International University. 28.3% of Cambodians live on less than $1.25 (purchasing power parity) per day (UNHDP 2011). A toilet averages $200, and paying for a toilet is difficult. The Cambodian Toilet Crisis struck a cord with us as it brought us to understand that the basic things we take for granted everyday is a luxury for another that is facing a tougher situation. We believed in what the University students set out to do, and we decided to back them up, giving them adequate resource, and consultation to show that although as a company, profits are important, but the well-being of others is just as equally important to us. 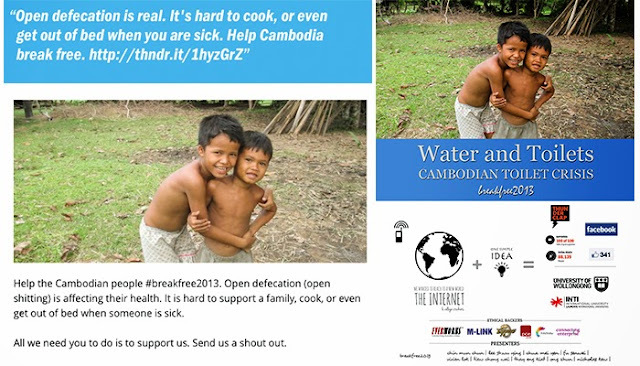 Contribute to Water and Toilets, a social business that aims to make a difference in the community by giving its time and resources to solving real world problems, and one of the problems that they are trying to solve right now is the Cambodian Toilet Crisis. Can you live on $1.25 a day? Did you already know that toilets were such a 'big' issue? How do you think, world problems like this can be solved?